Dr. Kip Litton DDS. He was the first recreational marathon cheat that I heard of. His story fascinates me to this day. Never before were one runner’s results scrutinized to the level that Dr. Kip Litton’s were. Even today, 6 years after his last official result, no one knows exactly how he accomplished the cheating. He even went so far as to create a fictional race in which he inserted himself among the fictitious finishers. Before Mike Rossi, Kip Litton was the first name (after Rosie Ruiz) that most runners thought of when it came to marathon cheating. For those not familiar with Kip, here’s a very interesting story about him that appeared in The New Yorker. 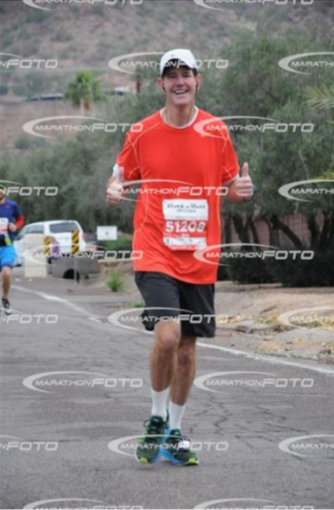 Last week I wrote an article about the RNR Arizona Marathon. and I featured a couple of runners including another dentist, Dr. Greg Pafford. His questionable results are limited to a single race – The Rock ‘N Roll Marathon in Phoenix Arizona – over a period of 12 years without interruption. 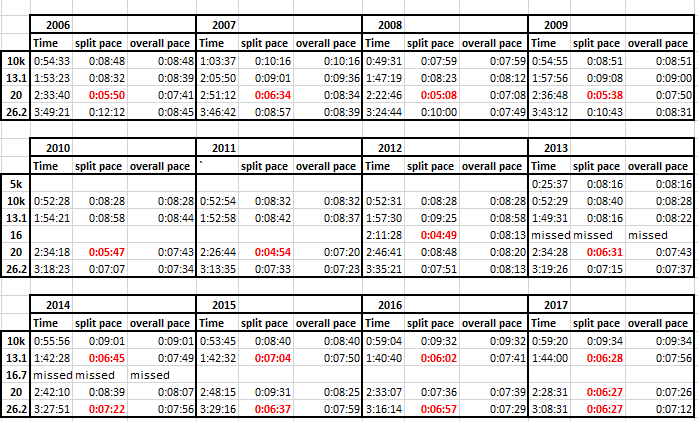 Below is a snapshot of my spreadsheet displaying all of his split times at Rock ‘N Roll Arizona Marathon since 2006. The paces are minutes/mile. In some years the mat locations changed. In 2012, the course changed. If a cell is blank, there was no timing mat that year,. If he missed a split, that is noted. The below map is a representation of the course through 2011. In every race from 2006 to 2011, Dr. Pafford has splits that are inconsistent with his normal pace. He did run a time of 4:12:47 in 2005 with normal looking splits. The obvious opportunity to cut would be on Thomas Rd. If one was to cut and pick up the course at mile 15, you would skip about 1 mile. In Dr. Pafford’s case, that would save about 8 minutes. Comparing the outlier splits to his 13.1 mile splits, Dr. Pafford ran the distance from 13.1 to 20 anywhere from about 3 minutes to over 4 minutes per mile faster than you would be expected, saving anywhere around 25 minutes or more in that 6.9 mile stretch each year. 25 minutes would be equivalent to about 3 miles at his normal pace, which would be representative of about 3 miles cut. That could have been accomplished by taking Thomas Rd all the way across to mile 20. These are his only other marathons during this time frame, meaning that he used the Arizona races as his qualifiers. These times are also in line with what would be expected given his normal pace in the RNR races. The easiest and most likely area to cut is the circled portion – the out and back section. The 13.1 marker is at the very beginning of this section. 2012 is very curious, the 4:49 split for the 2.9 mile stretch is definitely suspect. If you assume that he is incapable of running a 4:49 pace for 3 miles midway through a marathon when he ran the first half at a 9 minute pace, he would have needed outside assistance to hit the 16 mile mat when he did. As is the case with practically all of the races from 2012-2017 he only has photos near the finisher area. In 2013, he missed the 16 mile mat which is near the turnaround point. 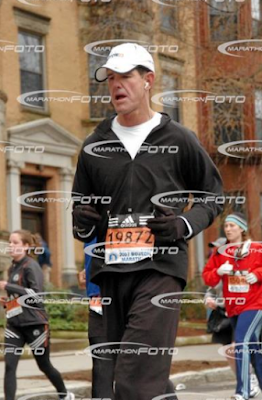 In 2014, there was a mat at the furthest point out at mile 16.7, which he missed. Also beginning in 2014 his splits from 20-26.2 were extremely fast. In 2014 through 2017, inexplicably there was no longer a mat placed on this out and back portion. Greg’s splits have gotten progressively more head scratching each year. He always has a remarkably fast split from 13.1 to 20, but lately there have been similar splits on the entire back half of the course. He has been disqualified from the 2017 race after registering a personal best time of 3:08:31 at the age of 55.. I will forward this article to the race officials. My hope would be to have them review the prior results, and if they disqualify him, have him removed from the official Boston finishers lists. At this points, that is more symbolic than anything. I am also of the opinion that any runner that cuts a course multiple times (can’t claim ignorance) or enters Boston with a falsified time should be permanently banned from the event. 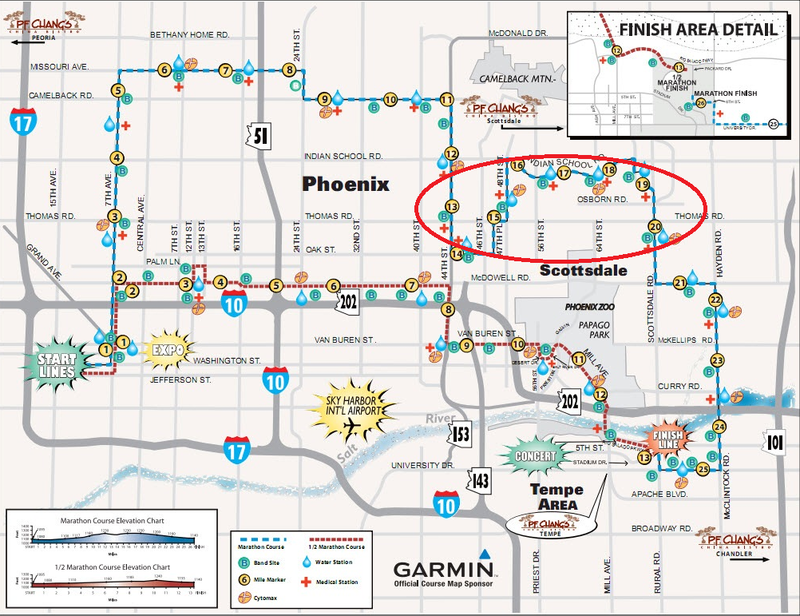 I also encourage the Rock ‘N Roll Arizona Marathon officials add back the timing mat on the out and back section at mile 16.7. I did attempt to contact Greg for comment, but have not received a reply as of yet. Please consider a contribution to help support the site. Contributions help to offset costs associated with running the site and help to enable me to compensate those that assist in data collection, etc. Thanks to all of you that that support Marathon Investigation! what a piece of work – great job putting this all together! I hope RnR and Boston wipe out all his results immediately. Wow, this is amazingly thorough. I can't stand cheaters and it is quite obvious that this guy had issues. I hope you actually reach him and talk to him, but I doubt he is in any shape to talk due to all the egg on his face! One wonders what he does with his patients. I work in mental health care and can't help but wonder at the mental health status of serial cheaters. I have to imagine having such a large secret would be extremely unhealthy. 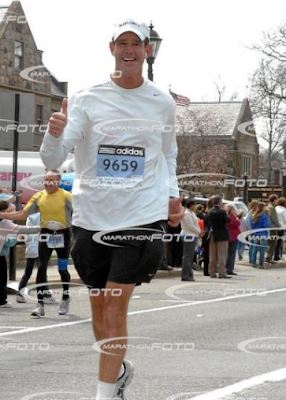 An old article of his where he talks about the bombing, what the marathon means to him, and how running and dentistry both require character. It is hard to trust anyone these days. It almost makes me want to quit sport all together as a professional. If the average person is cheating with nothing on the line other than pride, it makes me wonder about my fellow pros who have a lot on the line. President of the Arizona Dental Association. Ouch. maybe i'm having trouble navigating letsrun- but do threads on him keep disappearing? is he coming after you and trying to clean this up? What happened to the Gemkow article? You had said on LRC that you had one coming out but I don't think you ever published. I've started and stopped work on that one a bunch. I've tried contacting her, but no luck. When things slow down, or if she cheats her way to another AG award, I probably will push it out. Gave you $5. I noticed there was no mat for the turnaround…BAD. Otherwise a very well run race! Love the separate courses for half and full. So so weird to think I might have been running next to this guy…..just don't get it. …I suspect course a bit short. Came up with 26.15 on the Garmin… shortest out of 30 marathons so far. I did run the tangents religiously but my goodness..never had one come in that short. Perhaps RnR measures by driving a car? Maybe you should keep track of this too. Worth a couple of (unfair) minutes if true. That's 80m short. At 8min pace that's 24s. Not nothing, but not minutes. Letsrun will generally back down and delete threads if someone calls them and complains. There's not much of a pattern on what they delete, but sometimes a Brojo will say that they were called and deleted a thread (e.g., Alex Viada) in response. Hi Paul – You should look up this course in the USATF certified courses database (http://www.usatf.org/events/courses/search/). If it's on that list there will be a course map. Check that out and see if you remember running anything different from what the map says is supposed to be run. You never know, sometimes a race sets up a turn-around cone wrong or forgets to cone off part of the course that the designer meant for runners to stick to a certain line. For what it's worth, I've had my Garmin come up short once on course that I've measured for certification purposes. It's an odd thing, I don't know why it happens. It's a point to point half marathon that I measured with my Jones Counter (I produce races), then went back and ran it for a training run and my Garmin ETrex came up with 13.07 miles. All the miles were slightly off as we went along, but it didn't start being consistently short until we hit a long straight away on a bikepath. I biked that course too, and the ETrex got 13.08. But then I biked back to the start and it got 13.18. Not sure what to believe, but I'm confident my Jones Counter work was to USATF standards. When hiking the ETrex often shows short of "book distance" due to leaf cover and maybe other terrain issues, but that's the only time I've had it short on a road race course. This is my new favorite site, will go to PayPal after this comment, well done. As someone who has run the Rock N Roll Arizona Marathon every year since it started (think this year was #14), the level of cheating you've exposed is disgusting. This guy is a prominent dentist in Central Phoenix. Based on his Marathon Photos, looks to be a family guy..his kids are in tons of shots. How he can cheat like this year after year is beyond belief. It looks like he ran without cheating through halfway until 2014. Since then he's been running without cheating only through 10K and then cutting the course after that. 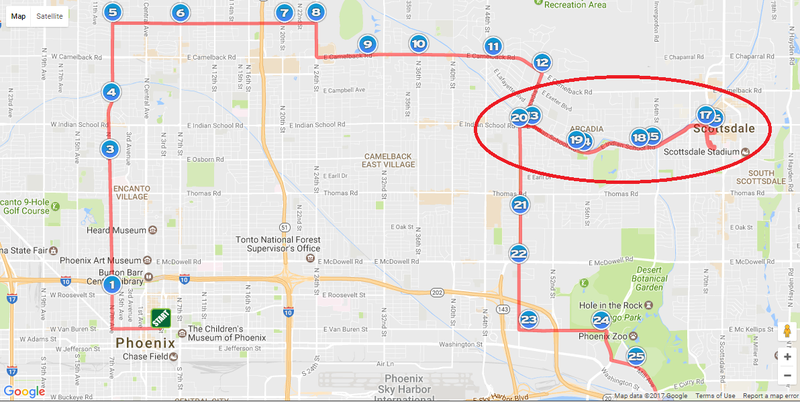 While it is super easy to cheat on the out and back along Indian School from 13 to 20, I can't figure out how he's getting from the 10K to the half. The Arizona Canal intersects with the course around mile 10.6. He could jump on the Canal and take it to Arcadia Dr., which is just before halfway. That may only save him about a mile, probably not enough to account for the super-fast split between 10K and half. But the yearly cheating between half and 20M is a piece of cake. A runner can easily cut over to the other side of the road on that out and back. Especially as you near mile 17, you could easily just cut out the whole loop around Downtown Scottsdale without drawing attention. I can't understand why his pre-2017 results are still out there on the RNRAZ site. The race should have disqualified him for the other years, where his pattern of cheating was just as obvious as 2017.